Shapely tile. Forgo the typical tiny floor tile in favor of something with a bit more heft, like this Hacienda tile from Ann Sacks. 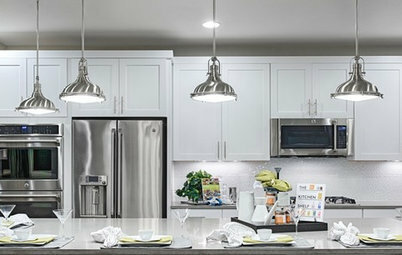 Paired with crisp white walls and cabinetry, the curvy tile looks rich and warm. Organic accents. 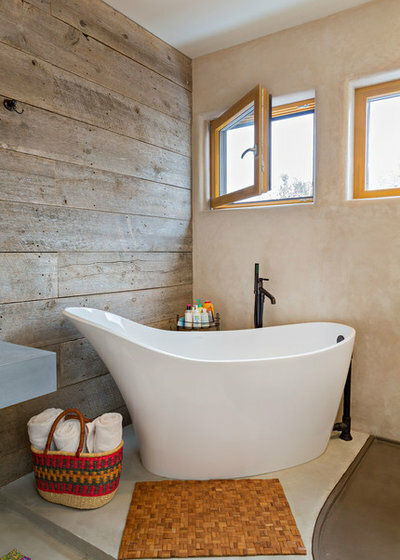 With all of the ceramic and porcelain surfaces in a bath, a bit of organic color and texture goes a long way toward making the space feel more personal. 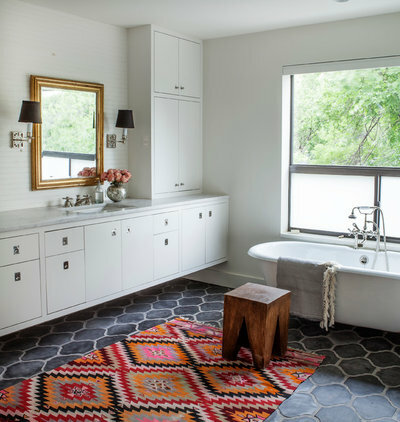 Try a carved wood stool, fringed towels, a woven basket or kilim-style rug. 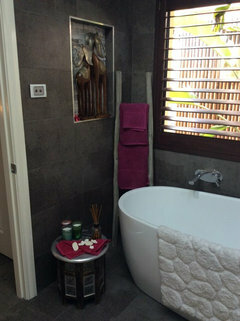 Sculptural tub. If a luxurious soak is at the top of your dream-bath wish list, consider something along the lines of this sleek, sculptural number from Victoria & Albert Baths. 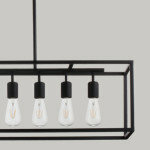 The organic shape is pleasing to the eye, and the raised back makes reclining while you soak comfortable. Driftwood mirror. 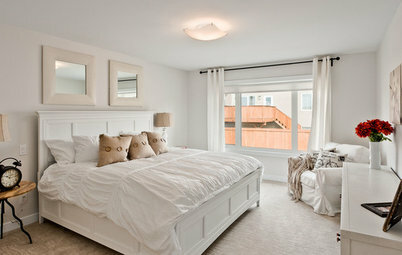 Sometimes one change is all you need to drastically alter the look and feel of a space. 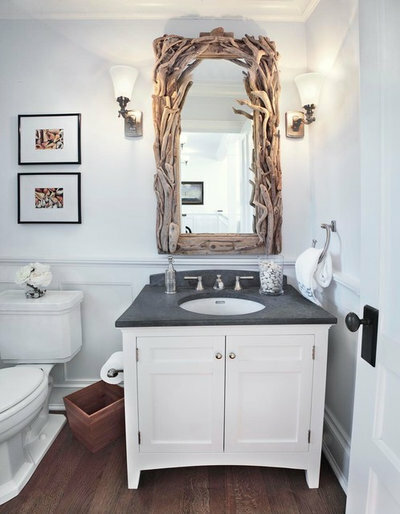 Case in point: Swapping out a medicine cabinet for a big, slightly wild-looking driftwood mirror can catapult a bathroom from ho-hum to stunning. Wood-look shiplap. 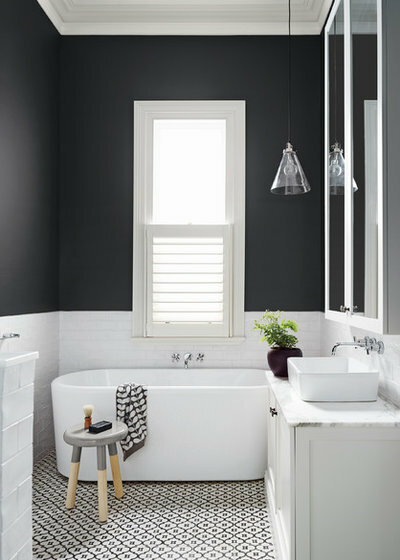 Keep a beach-inspired look going right through the bath without worrying about water damage with Corian sheet, cut to look like shiplap. In this master bath, the ceiling and walls are poplar wood shiplap siding, and the area inside the shower is Corian fabricated to match. 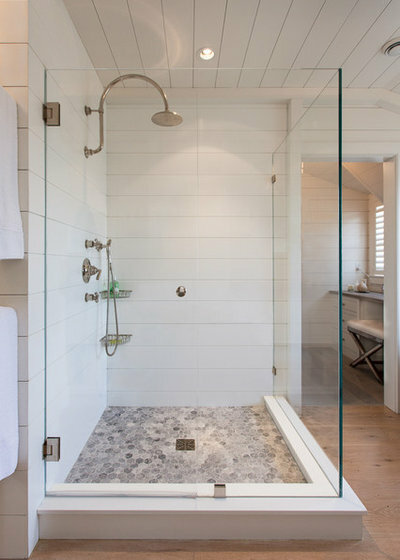 A spacious shower with glass surround, gooseneck shower head and gray hex tiles on the floor complete the fresh, coastal look. Herringbone tile floor. 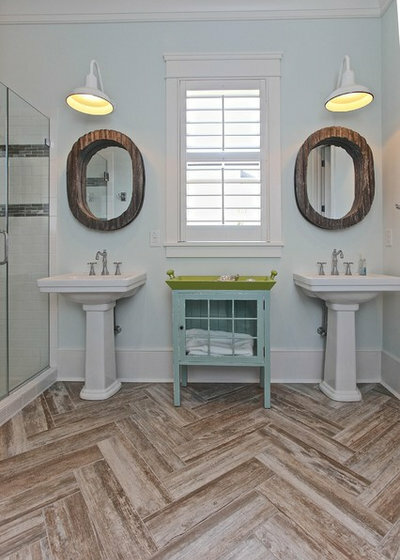 Less costly than laying wood floors in the bath, as well as more hard-wearing, a wood-look tile in a herringbone pattern offers the appearance of wood while preserving your budget. Chevron, Herringbone, Flame Stitch — What’s the Difference? Beach glam style. 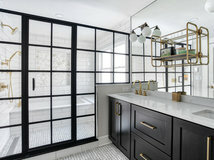 A shimmering, shell-like backsplash and gleaming sconces paired with a frameless mirror and back-lit translucent onyx counter set a glamorous tone in this master bath. Crisp white shiplap walls and the simple mirror keep things from feeling over-the-top. Bright and bold mosaic tile. 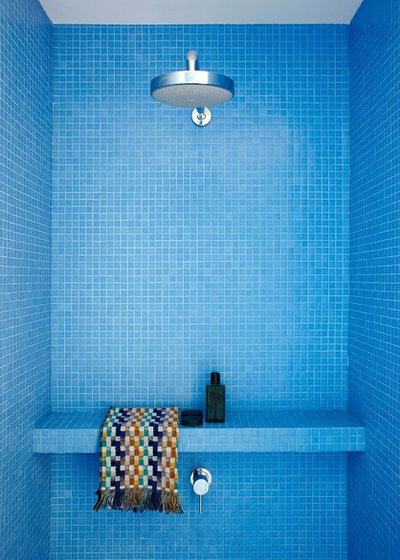 A vibrant blue mosaic tile looks especially striking in a clean-lined modern shower. 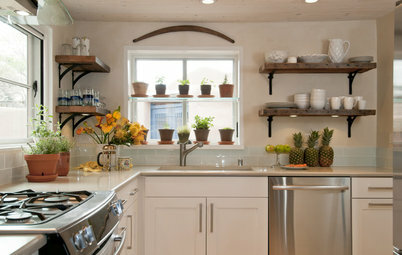 An oversize shower head and simple built-in shelf are all the extras needed. 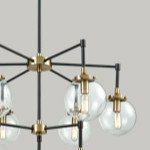 Megawatt yellow. 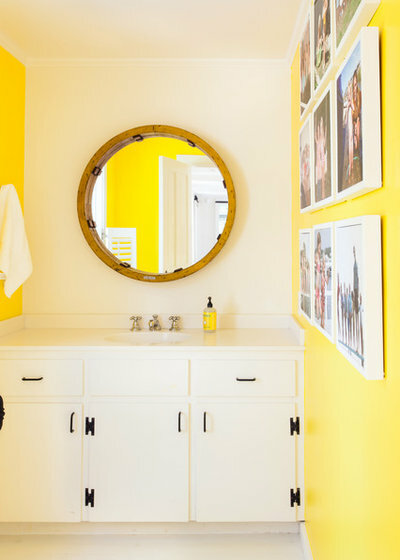 Give your bathroom or powder room a sunny makeover with two facing walls painted bright yellow. A zingy hue like this makes a great backdrop for photography, so take advantage and hang a grid of photos in matching white frames. Black and white all over. 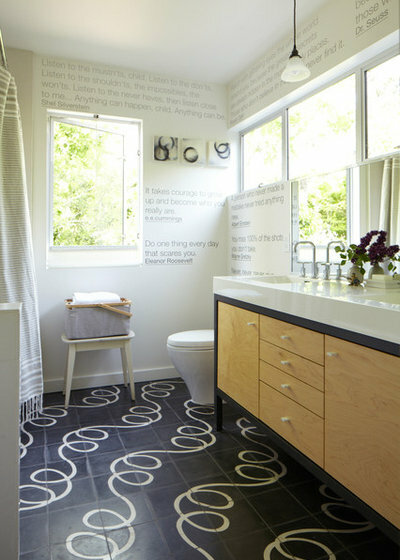 The black and white combo has been gaining steam in the bathroom. 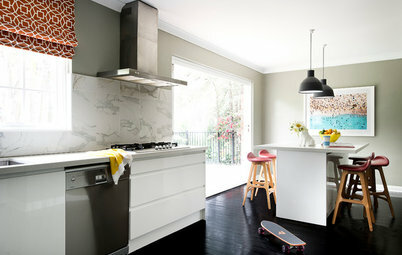 White subway tile and charcoal gray paint on the walls is chic on its own, but patterned black and white tile on the floor takes it to the next level. 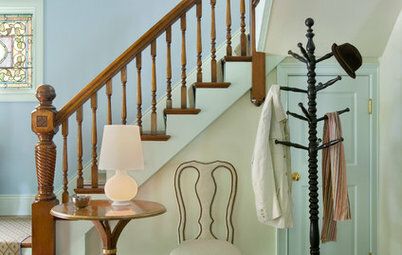 Finish on a strong note with an on-trend two-tone stool, graphic towel and maidenhair fern in a black pot. Nautical details. 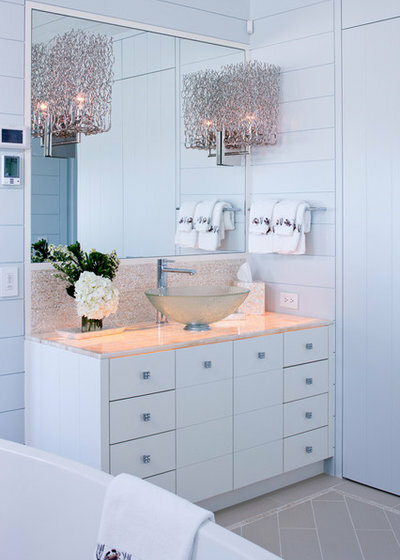 Nautical lighting, an iron tub and white shiplap walls and ceiling come together in this classic Nantucket beach cottage. A custom vanity provides ample storage without looking heavy, thanks to an open shelf on the bottom. 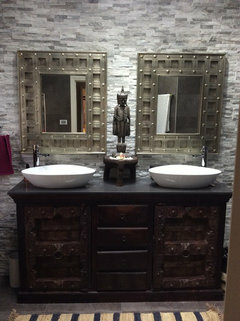 Statement tile. 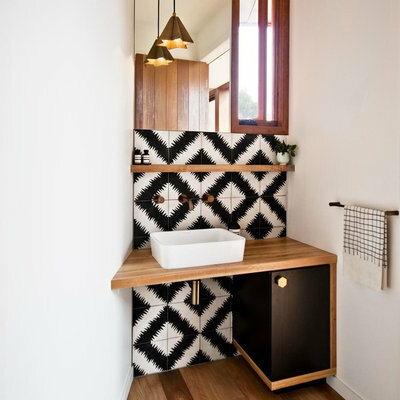 Make a big impact in a tiny powder room with a graphic tile backsplash. 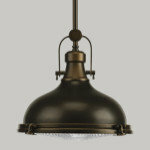 Since not much tile is needed, it’s easier to justify spending the money on something really special. 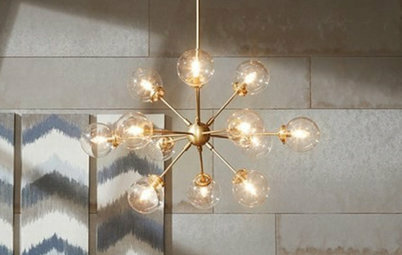 Try a chevron, ikat, herringbone or hand-painted design, or splurge on a custom mosaic. Quote wall. Use stencils or letter decals to display some of your favorite quotes right on the wall. 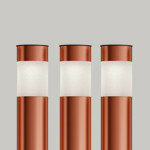 If using decals, be sure to choose the vinyl type, which hold up better in a bath’s humidity than do the fabric type. Mid-mod accessories. 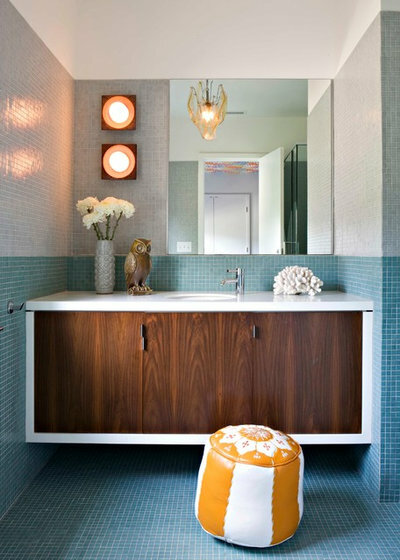 A floating white and wood vanity and color-block tile wall set a modern tone in this Los Angeles residence — but it’s the midcentury-style ceramic vase and wooden owl that steal the show. And while the Moroccan-style leather pouf looks amazing in this photo, you’d probably be better off going with an outdoor version if you want to keep it near the shower’s splash zone. Indoor-outdoor shower. 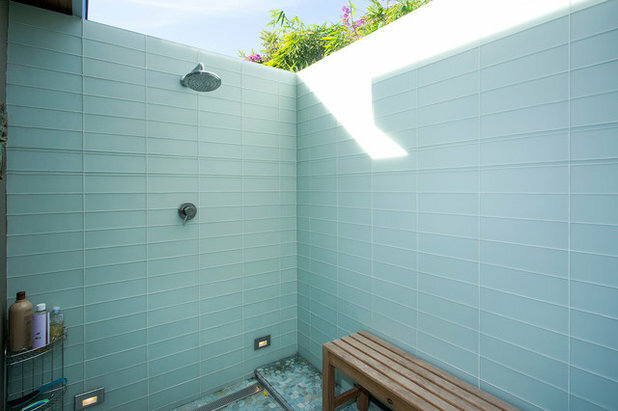 While certainly not appropriate for all climates, in a sunny locale like Southern California or Sydney, Australia, there’s no reason not to move the shower outdoors. 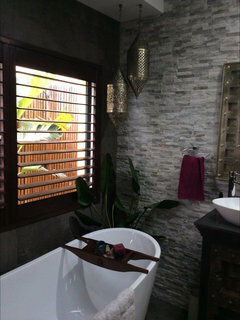 With privacy and open air, an indoor-outdoor shower connected to the bath by a glass door provides the best of both worlds. 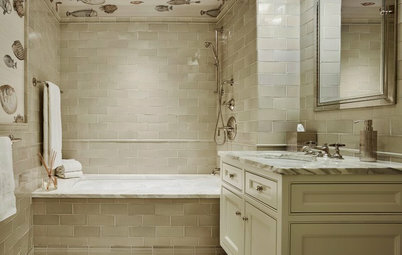 Are you planning a bathroom makeover or full remodel? What’s at the top of your wish list? Also recesses, everyone loves recesses! 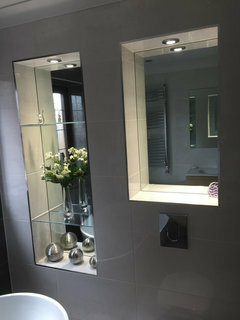 lots you can do with them, mirrored ones can add depth to your bathroom, whilst recesses in the shower or around the bath are excellent places to keep toiletries! Love the #2 bathtub and the outside shower. 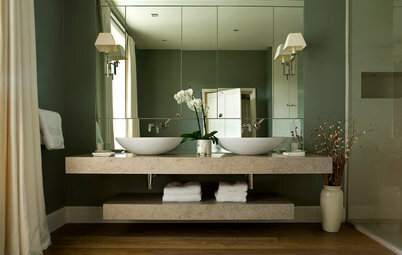 Bathroom Storage Bathroom Planning: Which Vanity Will Work for You?